Which VoIP Apps are the Best for free calls? Voice over Internet Protocol, commonly abbreviated to VoIP, is the digital age's answer to Alexander Graham Bell — today you can say “Mr. Watson, come here: I want to see you” without telephone wires, seven-digit numbers or cell plans. With VoIP, you can have a long-distance voice conversation over the internet, communicating instantly with anyone anywhere in the world from your laptop or smartphone. Skype is far and away the most popular and well established VoIP app, and for good reason. 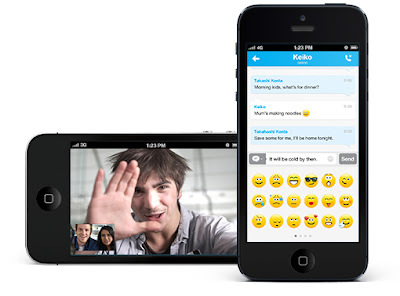 The famous video-call program also features voice and text communications options, and is so popular its name has become a verb. Its popularity also means that most of your contacts will likely already have an account, making quick calls even easier. And on the off chance that Grandma or your client overseas lacks Skype, you can call ordinary phone numbers as well. iCall is another fine option if you're an Apple aficionado (fan) . It works on all iProducts from the 'Pod to the 'Pad, allowing you to tap into the power of VoIP even if you don't have a smartphone. You can call landline phones for free, too, further increasing its possibilities. iCall functions as a multi- platform chat client on the side, allowing you to manage your Facebook, Google Chat, Windows Live and AIM accounts simultaneously and message any of your contacts on any platform. Jajah is yet another contender in the VoIP world, a multi-smartphone solution with a somewhat different approach than the alternatives. While you can make calls to other JaJah users or phone numbers like most VoIP clients, the app's Facebook integration makes communication even easier. Simply scroll through a list of your Facebook friends, click on one, and JaJah will call them for free — whether they've got the app or not. Vippie is the Android alternative to iCall, allowing users of Google's mobile operating system to make free VoIP calls to fellow users. Video and text chats are also possible, plus a wide range of other useful features, allowing you to share pictures and music with your friends. Vippie comes with all the bells and whistles your smartphone does, including voicemail and conference calls. With the diversity of VoIP options available, you should have no difficulty in selecting one that suits your needs. Comparing the apps' ability to communicate with your contacts and their feature lists are a good way to choose between them. All it takes is a quick download and you can kiss your phone bills goodbye. With most of these VoIP apps available to download for free, smartphone users can start enjoying the benefits of free calls, text and video calling right now. Author Bio: The top VoIP apps were reviewed by Jonny Grant on behalf of Packnet; a Manchester based telecommunications company who offer a range of business telephone and business voip solutions.